Elemental Changes in the Next Build. In light of the shaman Q&A after the last beta build, a blue poster has confirmed that in the next push, elemental shaman will be using Lightning Shield in preference to Water Shield. While the precise changes being made to the shield haven’t been confirmed, the blue poster is quoted as stating it will provide a damage increase in some capacity. In addition to the shield changes, it’s also been stated that elemental shaman will be utilising Earthquake rather than Fire Nova in AoE situations. Once again, the specifics of this haven’t been detailed. In the next beta build (or the one after that), you will see two important changes to Elemental shaman. First, you will use Lightning Shield (for damage!) instead of Water Shield. Second, you will want to use Earthquake for AE over Fire Nova. These changes, especially the former, will provide Elemental shaman with a bit of an upgrade in the rotation over what you’re used to in LK. Firstly, it will be great to finally use a shield more specifically tailored to the elemental tree. The mana regeneration of Water Shield has been nice but wouldn’t we all prefer a damage increasing shield? On the other hand, this may mean we are pressed towards taking mana regeneration talents that have been mostly skipped over in possible Cataclysm talent builds. If Fire Nova is indeed made unattractive to us however (or sub-part to Earthquake at least), there is perhaps the potential to ignore the Improved Fire Nova talent. This is pure speculation however and it has yet to be seen how a talented Fire Nova will compare to Earthquake after these changes go live. — Art of the Cataclysm art book, featuring 176 pages of never-before-seen images from the archives of the Blizzard Entertainment cinematics department and the World of Warcraft development team, as well as progressive visuals from multiple stages of development. 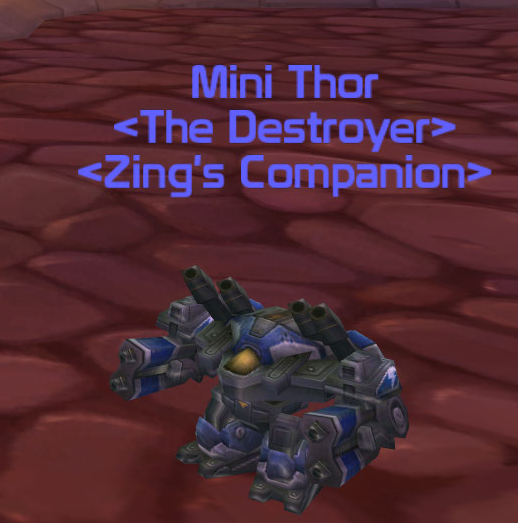 — Exclusive in-game pet: he may not be a breaker of worlds just yet, but Lil’ Deathwing will still proudly accompany heroes on their struggle to save Azeroth from his much, much larger counterpart. — Behind-the-scenes DVD with over an hour of developer interviews and commentaries, as well as a special Warcraft(R) retrospective examining the rich gaming history of the Warcraft universe. — Soundtrack featuring 10 epic new tracks from Cataclysm, including exclusive bonus tracks. — Special-edition mouse pad depicting Deathwing menacing the ravaged continents of Azeroth. — World of Warcraft Trading Card Game cards, including a 60-card starter deck from the Wrathgate series, two extended-art cards, and two Collector’s Edition-exclusive hero cards, marking the first appearance of goblin and worgen heroes in the TCG. The first two World of Warcraft expansions, The Burning Crusade(R) and Wrath of the Lich King(R), each shattered PC game sales records upon their release. In Cataclysm, the face of Azeroth will be forever altered by the return of the corrupted Dragon Aspect Deathwing. Players will explore once-familiar areas of the world that have now been reshaped by the devastation and filled with new adventures. In an effort to survive the planet-shattering cataclysm, two new playable races — worgen and goblins — will join the struggle between the Alliance and the Horde. As players journey to the new level cap of 85, they’ll discover newly revealed locations, acquire new levels of power, and come face to face with Deathwing in a battle to determine the fate of the world. 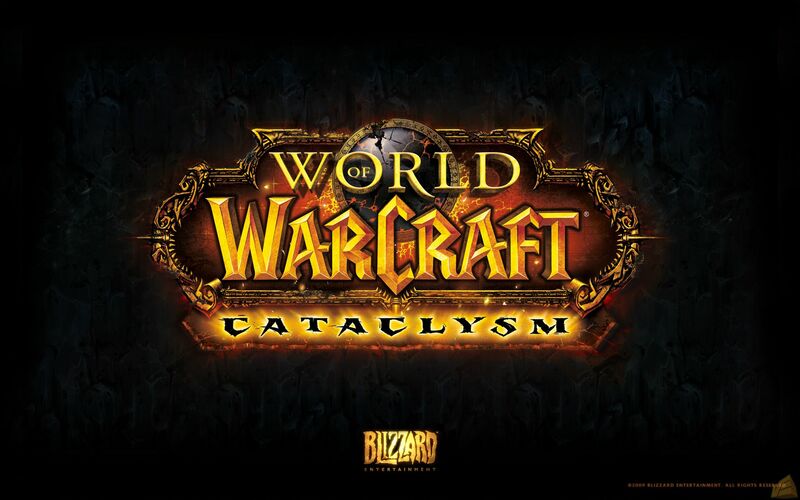 The beta test for World of Warcraft: Cataclysm is currently underway. To set up a Battle.net account and sign up for a chance to participate, please visit the official Battle.net website at http://www.battle.net. This has caused speculation amongst the community that online retailers will not be distributing the Collector’s Edition this time. Conversely however, Amazon are already listing it for preorder. There’s still no word, hint or rumours about possible release dates, though the press release states we’ll here more about that in “coming months”. It is still set for a 2010 release though. Most of the remaining news has revolved around the guild levelling system being introduced with the expansion launch. I’m intending on dedicating an entire article to these changes over the course of the next week. A new beta build was applied to the test servers over the weekend. In addition to changes for all three shaman specs, there has been a Q&A panel with Ghostcrawler. Maelstrom Weapon now also reduces the mana cost of the spell. When will elemental not have to run into melee to do aoe? Are resto shaman now the only healer being forced to spec into a hit talent to supplement their active mana recovery ability? Paladins now apparently get the hit that was in enlightened judgements for free? Our goal was to not have all of the healer talent trees to be mirror images of each other. So a priest might get one thing for free and have to talent into something else. As long as the end result is pretty similar (e.g. the priest can’t get everything for free and just be able to spend talent points on candy) then it should be fine. Personally, I’d like to know the rationale behind the fact that the Elemental Shamans did not recieve any spells that alter their rotation on ‘primary’ targets. Their level 10 effect was something halfway between a mana restore, an AoE, and a pvp gimmick. Our capstone of the talent tree is an AoE. I can’t think of any other dps spec that doesn’t get something ‘unique’ that changes their rotation from the other specs. That’s just part of the shaman design though, namely that Enhancement still cares a lot about spells instead of being a 100% melee weapon class. I’d argue that Enhance and Elemental still play fairly differently (such that you do have to adjust when respeccing). I’m not sure the mage design, where there is virtually no overlap among talent trees, is a superior model. It’s just a different model. Mana – I’ve heard mana has recently begun to be an issue for Enhancement in the last few beta builds. Will the ultimate solution just be to tweak Primal Wisdom s’more? 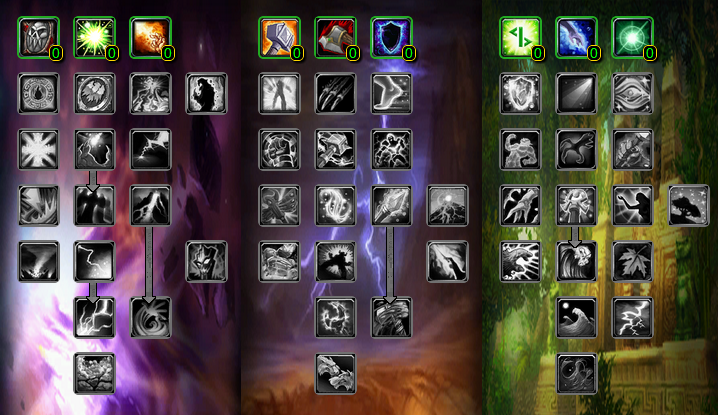 Oh, and what about all that discussion about moving Primal Wisdom to being part of Enhancement’s lvl 10 skillset? It’s going to be hellish on new Enhancers not having their primary mana restoration technique until much later. Also on the table here, and I’m sorry it touches on totems again – a full set of totems or an AoE rotation kills Enhancement’s mana very very quickly. It’d be nice if the mana cost got reduced on some of these abilities. It’s not the intent that Enhancement has to worry about mana a lot. Generally you should have enough mana to do what you want to do. It’s a model we’re still adjusting. 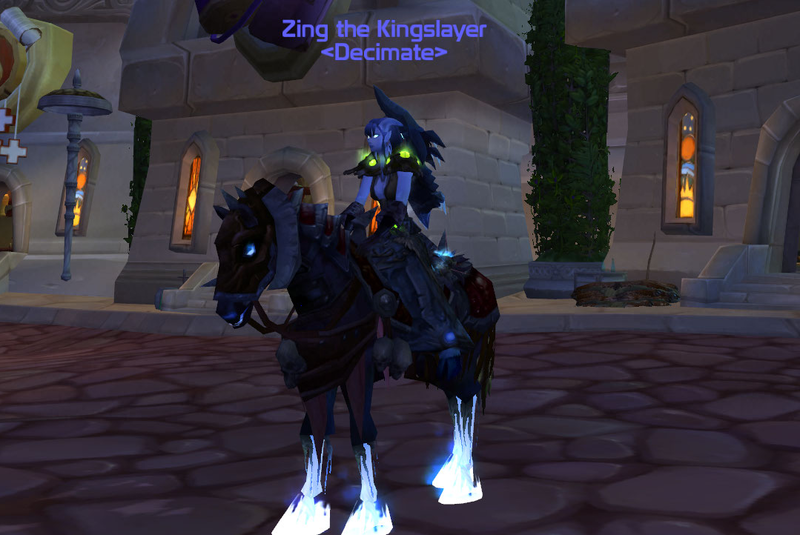 We haven’t quite established a base regen for the casters and healers that we’re happy with and every time we tweak that, it affects the Ret paladins and Enhancement shaman, who aren’t really supposed to be mana-constrained. This is the kind of thing I’m talking about. Tier 1 of Enhance is one of the bigger culprits. While tier 2 has one talent that’s really attractive (nigh on required for Elemental and Enhance), tier 1 is pretty bland. People would prefer to skip over Imp Shields, and Elemental Weapons is a flat spell power buff that scales with level rather than gear. Also, Enhance has 9 “required” points in Elemental – would be 10 if it weren’t for Ancestral Swiftness – on top of their own tree being filled up, which highly limits their utility options (well, to be more specific, limits them to 0). Even if an additional point or two were freed up, they may feel obligated to spend those to grab the third point in Acuity (which I don’t like as 3 points to start with – it creates a ‘floater’ point in Elemental specs rather than getting us stuck around tier 4 needing to pick a full utility talent, which I think is a good thing. But I digress), or Improved Shields, even though all three are fairly marginal DPS gains. Yup. This is a challenge. As I mentioned above, Enhancement likes spell damage so it’s hard to put anything in Elemental that Elemental wants that Enhancement also doesn’t want. Lightning and Water shield do not seem that useful for Elemental in many ways. Agreed. This is something we’re discussing. A new shield doesn’t have to be the answer though. Nature’s Blessing doesn’t feel like a bonus when healing earth shielded targets, it feels like a penalty when healing targets without it. If the intent is to make shamans better tank healers, perhaps make it work in some other way. Perhaps change it to Earthliving or Riptide instead of Earth Shield? This is the kind of feedback we struggle with a lot on most classes. As soon as something grants a bonus, it feels like a penalty when it’s not up because players are very efficiency-focused. If it was say Riptide, wouldn’t it feel like a penalty whenever Riptide wasn’t available? Or a penalty because every heal cost that extra GCD for Riptide in order to behave at maximum efficiency? Honestly GC when our dps is competitive with the other hybrid specs you barely ever see us whine. We just really want to be as good as others. It’s when it isn’t that we come out in masses to whine about everything. Since our totems are our thing they are what is an easy target for our QQ. I guarantee you that if we do competitive DPS and never fall behind the endless Shaman crying will be puddles instead of rivers. I agree with that. I think a lot of the complaints about “we’re the only class” or “are buffs aren’t awesome enough” only come to bear when dps is low. As I said recently, we think Enhancement dps was competitive when there wasn’t a lot of movement involved and when you weren’t competing with guys using orange weapons. We can fix the movement problem. We don’t think we need to fix the legendary “problem” because those Shadowmournes will all be banked at level 85. I honestly don’t see how healing rains AND chain heal are needed. Both are AoE heals fill the same role (heal people grouped together). They are different spells with different niches. Chain Heal excels when you have a small number of players injured and Healing Rain is more for those big bursts when everyone takes damage. There are enough occasions when you need to heal say more than just the tank that we think healers can stand to have several different strategies to deal with it. Any chance that the stoneclaw glyph can become baseline or something? I’m mostly fine with the totem utility vs. buff thing, but it seems fairly weird to have this non-scaling bubble as a secondary effect of a totem. If it can’t be baseline, is it being compensated for? Hance isn’t exactly a survivability powerhouse. At this point tho, after getting the current tier hit/spirit cap, I’m pretty much forced to handpick items with no or little crit rating however. Mastery and haste just seem so overwhelmingly better. That’s not the intent. Hit / spirit can be capped, but if you start viewing haste, crit or mastery as junk compared to another stat, then we need to change something. It’s fine if one stat is slightly better than another. Remember that crit values overall are going to be far lower than the 70%+ that some players can reach in current content. Lava Burst crits, sure, but you cast a lot of spells besides Lava Burst. Whether it will continue to attack stuff we are not in combat with (especially if it’s range is increased). This is something we are trying to fix. We already have the totem choosing your target. Next we need to make sure it doesn’t “helpfully” grab additional mobs. The increase on the damage of Lava Burst is, obviously, great news for elemental players and it’s nice to see a mana cost reduction on Magma Totem given that heavy AoE situations tend to be a severe drain on our mana pools. From the Q&A section, Blizzard clearly believe that the implementation of Earthquake will help a great deal with the movement issues facing elemental players. There’s no mention there of their original idea to allow us to “throw” our totems into the thick of the action rather than having them drop at our feet. I’m hoping this idea will still be pursued before Cataclysm’s release as it would be a huge improvement to how elemental plays. The issue of neither Water Shield nor Lightning Shield being specifically aimed at the elemental tree was mentioned. I’ve seen numerous suggestions on other forums calling for some kind of “fire shield” to be added, allowing us to benefit from an increase in fire damage for a short period of time. Evidently the developers are at least acknowledging the lack of elemental shield for our tree but whether they choose to tweak the mechanics of a current shield to benefit us more as opposed to designing a new buff entirely has yet to be seen. There has a been a lot of more generalised Cataclysm news over the past week ranging from clarification of the rewards earned from guild advancement to UI tweaks and crafted items from various professions (including details of the engineering only “cogwheels”.) I’m going to aim to do a couple of blog updates this week to catch up with these changes and I’ll also update the Cataclysm F.A.Q section as I go along. For now, enjoy the shaman changes! A patch released to the beta yesterday delivered both a new launcher and more class changes all around. After the lack of shaman changes in the last build, all three specs have received some tweaking. In addition to the detailed changes, there appear to have been some stealth changes that have been pushed out without mention. These didn’t occur yesterday (yes, I’m slow on the news, my apologies), but they are quite significant. Hex now lasts 1 minute, up from 30 seconds. Searing Totem now prefer to target enemies that are afflicted by your Flame Shock or Stormstrike effects. Reverberation is now a Tier 2 talent. Down from Tier 3. Improved Fire Nova is now a Tier 3 talent. Up from Tier 2. Elemental Warding now reduces magical damage instead of all damage. Ancestral Knowledge is now named Acuity and increases your critical strike chance with all spells and attacks by 1/2/3%. Convection now reduces the mana cost of your damaging offensive spells. Lightning Mastery was removed when the thirty one point talent trees were released. 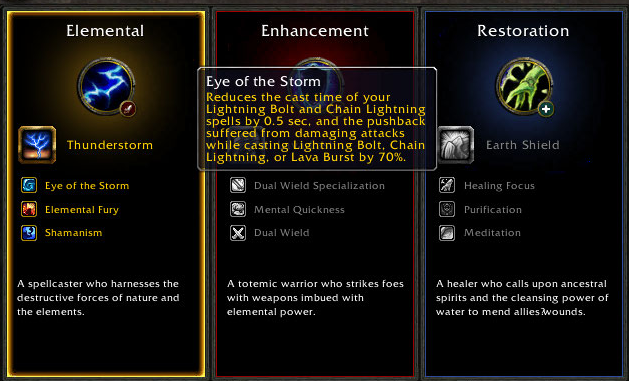 Eye of the Storm was made a primary skill as opposed to a talent and had the cast time reduction component from Lightning Mastery incorporated into it. Without the cast time reduction, Lava Burst’s effective cast time has risen from 1.5 seconds to 2 seconds. In addition, it has seen a small increase in it’s base damage. Update:- I’ve finally patched the new launcher and this change no longer seems to be on the beta build. Eye of the Storm lists Lava Burst in it’s tooltip and it’s cast time reduction appears to be applying. 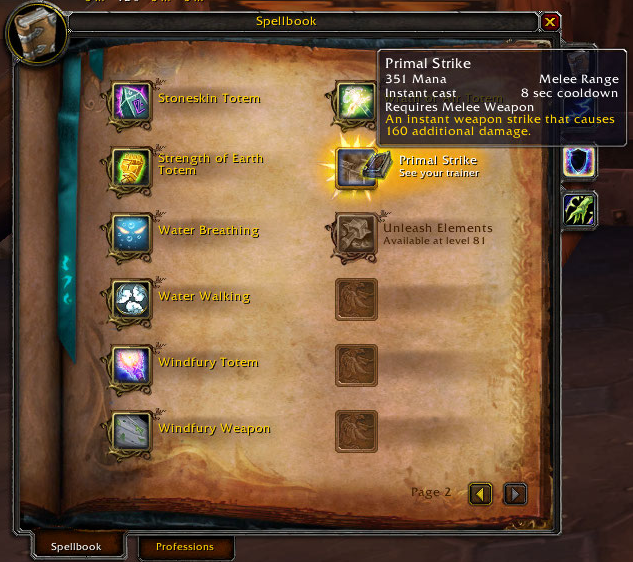 Static Shock now procs from Primal Strike, Stormstrike, or Lava Lash (as opposed to all melee attacks and abilities). Chance to proc increased from 2/4/6% to 15/30/45%. 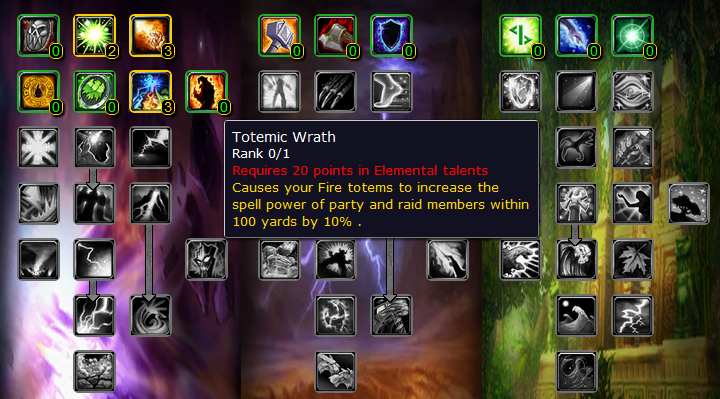 Totemic Reach – New Talent – Increases the radius of your totems’ effects by 15/30%. Totemic Focus is now a two ranks talent, down from three ranks. Now also increases the duration of your totems by 20/40%. Cleansing Waters – New Talent – When your Cleanse Spirit successfully removes a harmful effect, you also heal the target for [ 1093 to 1164 ]/[ 2187 to 2330 ]. As always, you can see the current talent trees via the calculator at MMO Champion. For your convenience, here is the direct link to the shaman tree. Ancestral Knowledge has been removed and replaced with Acuity. Ancestral Knowledge provided a 10% increase in intellect. In Cataclysm, intellect effects spell power, critical strike chance, mana pool size and potentially, mana regeneration depending on whether or not you choose to take Unrelenting Storm. Acuity increases our critical strike rating. It’s worth noting here that the patch notes state it provides a 1%, 2% and 3% increase while the talent calculator is showing a 5%, 10% and 15% increase. MMO Champion have stated that they’re aware of some tooltips in the talent calculator showing incorrectly and the values of the post are correct. Critical strike chance awards us with a few possibilities. The most obvious is the chance that our spell hit deals more damage than normal. For an elemental shaman, a critical strike also triggers our Elemental Focus talent, allowing us to enter a Clearcasting state. The Clearcasting state alone reduces the mana cost of our next two spells by 40%. Finally, when Clearcasting is active, we deal 10% more spell damage due to the Elemental Oath talent. This all sounds great and indeed it is but there’s a downside to the stat. Critical strike rating always has an RNG factor. It doesn’t provide the static DPS increase that haste or spell power do. A higher critical strike rating increases the statistical chance to receive a crit from an offensive spell but it’s still a chance. 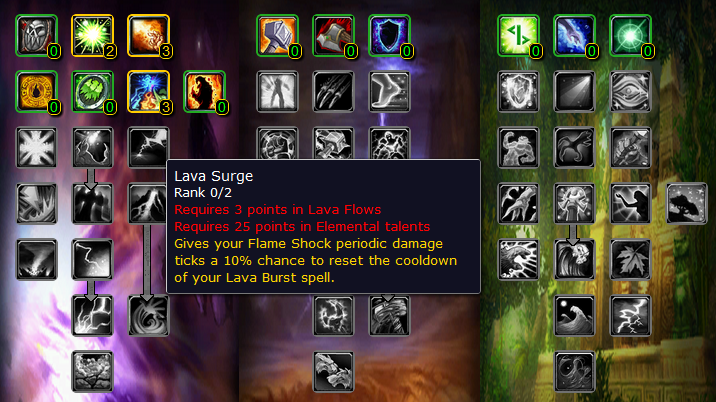 The second problem for an elemental shaman in regards to critical strike rating is Lava Burst. Assuming Lava Burst is cast when Flame Shock is ticking on a target, it’s a guaranteed critical strike anyway, regardless of our personal stats. Having our critical strike rating not influence one of our primary nukes detracts somewhat from it’s value to us. 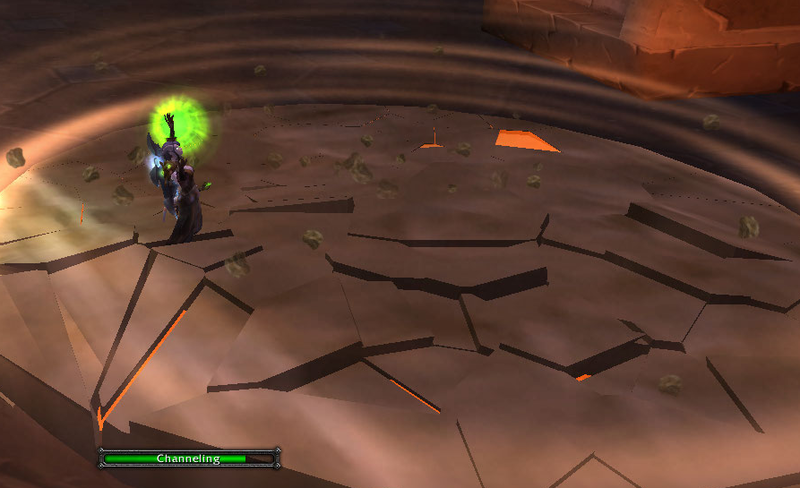 On live, elemental shaman derive crit from a number of sources in a raid environment. One such source is the enhancement Thundering Strikes talent that is included in most cookie cutter elemental builds. This provides a 5% increase at max rank and is a talent we’re losing in Cataclysm. Call of Thunder, also removed for Cataclysm, increases the critical strike rating of our lightning spells by 5% (again at it’s maximum rank.) It’s possible therefore, that the introduction of Acuity is to make up for some of the talents being removed. The AI of offensive totems has been criticized for a long time and it’s undoubtedly frustrating to drop a Searing Totem next to a boss and then watch it hit a completely different target. While this change is welcomed it doesn’t address the range issues of Searing Totem (and the movement problems this can cause elemental shaman) nor is there mention of a fix to the bugs encountered where the totem just sits and does nothing. Hopefully there will be more changes to the Searing Totem mechanic in the future. This is purely a positioning switch to allow Reverberation to reside higher up the elemental tree. This change basically removes the mana cost reduction of Wind Shear; our interrupting spell. This is a highly predictable amendment to address any players questioning whether these two buffs could be used back to back. Totemic Reach *New* – Increases the radius of your totems’ effects by 15/30%. Shaman have been asking for a talent to increase the radius of our totems and Blizzard have delivered. Does this talent also increase the range of Searing totem? The inclusion of this talent gives us more interesting choices to make regarding our build. It is possible to take both Totemic Reach and our beloved Ancestral Swiftness (see this build as an example.) However, that does mean sacrificing points elsewhere. I’ve mentioned before that I personally see little compelling reason to take Elemental Reach unless the range of our Searing Totem is increased to match it. (If I have to either stand closer to a boss to keep placing Searing Totem, I see little benefit from having my spells out range this.) If this talent allows a greater distance on Searing Totem however, Elemental Reach becomes more interesting yet the build shown above doesn’t allow for both it and Elemental Warding for example. Taking both Ancestral Swiftness and Totemic Reach would also prevent us dipping into the restoration tree for Ancestral Resolve. Grants a 20% chance for Elemental Overload to occur. Elemental Overload causes a Lightning Bolt, Chain Lightning, or Lava Burst spell you cast to trigger a second, similar spell on the same target at no additional cost that causes 60% of normal damage and no threat. Chance to trigger increased further by mastery rating. The Cataclysm Compendium has been updated to incorporate the above information. Finally, on the subject of editing old articles, the Elemental FAQ also received it’s overhaul yesterday. Feedback is welcome! Elemental Mastery and Nature’s Swiftness no longer sharing a cooldown doesn’t impact us as it’s impossible to take both talents. The new changes have all been accounted for in the MMO Champion Talent Calculator which can, as always, be found here. 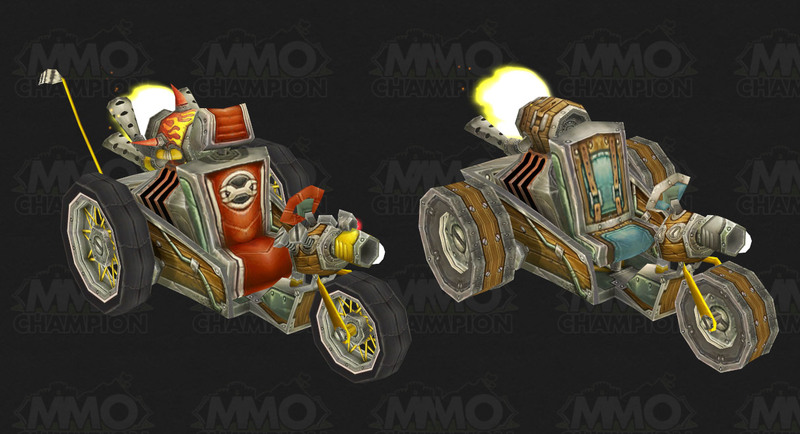 Goblin ground mount model images have been shown over at MMO Champion also and while I tend to avoid publishing beta images (purely because I can’t keep up with how fast they appear), these are too cute to ignore. 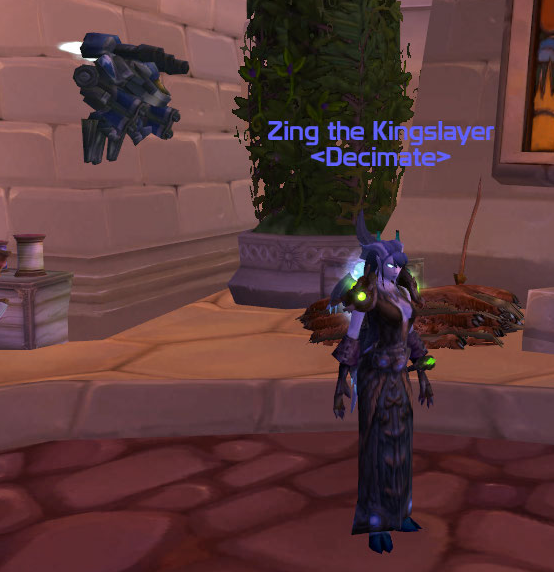 In closing, I’ve finally been fortunate enough to obtain Cataclysm beta and having a “hands on” feeling for the class changes is something I’m greatly looking forward to. 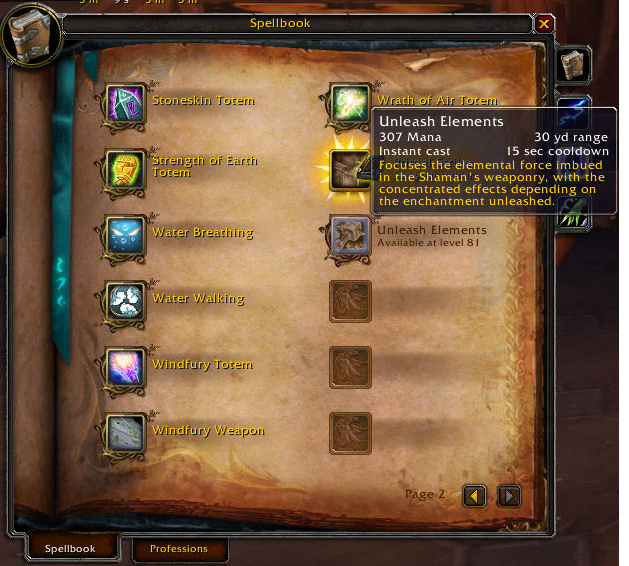 Hopefully, I’ll be bringing you my thoughts next week on how the elemental spec is shaping up. Starcraft II received it’s greatly anticipated launch last night (I’m sure I wasn’t the only person queuing outside) and while not directly related to World of Warcraft, the collector’s edition did boast an in game vanity pet. He has an amazing in game animation (though his place in the genre is undoubtedly debatable). Learning this pet does grant a Feat of Strength for those interested in such achievements. He’s definitely one for the vanity pet collector’s out there. 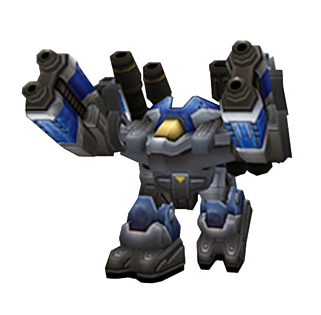 Sadly for those who aren’t interested in playing Starcraft, you do need to install and register the game’s keycode to receive this pet. He’s automatically mailed out to all characters on your battlenet account (assuming, of course, that you register your Starcraft key to the same account.) The pet isn’t any kind of code that you can grab from the box so reselling the game isn’t an option. Finally, I spent this morning updating my article on major glyph choices for the elemental shaman. You can find it here should you be interested in checking that out. It’s now entirely up to date and contains a little more in depth data about each glyph. Cataclysm beta is well and truly under way. The state of the talent trees changes at a rapid rate with the tweaking still very much in progress. Whilst I will aim to keep this compendium up to date, the latest changes will always be published on my front page before the edits are made to this article. Most of this information came from Blizzcon 2009 when the Cataclysm expansion was confirmed. In an attempt to simplify the high end game and the challenge of balancing various stats, many are being removed, merged or morphed in some fashion. The difference in hit points between plate wearers and cloth wearers is being drastically reduced for Cataclysm. For casters, we can expect to see much larger health pools than in the previous expansions. This drastic change was also announced at Blizzcon 2009 and is still a topic of contention. Never the less, spell power as a stat is mostly being removed from the game. 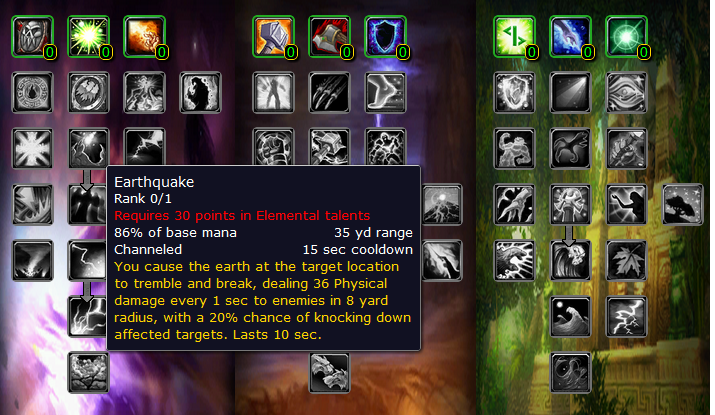 Come Cataclysm’s launch, intellect will be the main source of spell power for DPS casters. A slight exception was made to this when it was announced that caster DPS weapons will contain spell power as an actual stat. The justification for this is to make them comparable to melee weapons in how attractive they are for the casters. While this has never been a stat that has affected shaman (aside from the annoyance of it appearing on otherwise nicely itemised items), spirit has always influenced the in combat mana regeneration of other casters. When Cataclysm goes live, spirit will no longer appear on most caster DPS items and mana regeneration for these classes and specs will be dealt with via a different system. Spirit will be the primary source of mana regeneration for healers however. Elemental shaman and balance druids are the exception to the above rules however. Both these class spec combinations will be sharing their gear with their healing counter parts. As such, they will have talents that allow conversion of spirit to hit so as to ensure that the spirit component of their gear is not wasted. In the shaman class review of Cataclysm changes, it was announced that this conversion would be bundled into another, more attractive talent rather than expecting shaman’s to spend points purely on converting spirit to hit. However, when the newly pruned (thirty one point) talent trees appeared, the spirit to hit conversion was a stand alone entity. Currently it takes the form of Elemental Precision and appears as a tier two elemental talent. For our restoration friends (or our restoration offspecs), MP5 will now be a thing of the past as this stat is being removed from the game entirely. Spirit will now influence the mana regeneration of our restoration tree. Where most stats are being trimmed and pruned away, mastery is a new stat to grace our gear in the expansion. This stat is directly tied to our talent choices and to quote the blue poster simply allows us to “become better at whatever makes their chosen talent tree cool or unique”. We’ve been promised a more thorough explanation of this in the up and coming weeks. Your gear will have spirit on it. It won’t have hit on it. To stop the spirit to hit conversion feeling like a dull but mandatory talent, these conversions will be bundled into another, more interesting talent. An instant weapon strike that causes 10 additional damage. This is a new weapon based attack designed to make levelling as enhancement more appealing. This is to tackle the complaint that most of the core enhancement talents come very late in the tree and many lower level shaman levelling as such find themselves primarily casting lightning bolt and thus, feeling more like elemental players. Heals a friendly target for 34 to 44. This is an entirely new healing spell being added to the shaman arsenal. The intention is for this spell to become our core, single target healing spell. Due to this change, our current healing wave will be renamed to greater healing wave. As such, we will have lesser healing wave, healing wave and greater healing wave. The lesser and greater varieties are deemed to be more situational. Managing mana is going to become much more vital to all healers in Cataclysm. You can expect, therefore, that selecting the correct spell depending upon the situation will be quite critical. Binds the target hostile elemental for up to 50 sec. The bound unit is unable to move, attack or cast spells. Any damage caused will release the target. Only one target can be bound at a time. Focuses the elemental force imbued in the Shaman’s weaponry, with the concentrated effects depending on the enchantment unleashed. “Unleashes the power of your weapon enchants for additional effects.” A dual-wielding enhancement shaman will activate the effects of both their weapon enchants. Calls forth healing rains to blanket the area targeted by the shaman, restoring 1827 to 2173 health to allies in the area every 2 sec for 10 sec. An area of effect, heal over time spell that calls down rain, healing all players within the selected area. There is no limit to the number of players that can be effected by this heal but you can expect a diminishing returns mechanic like with many AoEs. When this self-targeted buff is active, your spells are no longer interrupted by movement and possibly even by your own attacks. This will give shaman of all three specs another way to heal or do damage when it’s necessary to move in both PvE and PvP. As part of wider changes to the way cleansing works (and which classes and specs can do so), some changes have been made to shamans. Shaman’s will no longer be able to remove poisons. Attempting to cleanse or dispel a target that isn’t inflicted with a debuff will still result in the mana being spent. At present, the spell will simply not cast and this encourages a spam fest approach to cleansing. Restoration shaman and other healing classes will need to pay attention to mana more than they’ve had to during Wrath of the Lich King. Spirit will be the restoration shaman’s primary mana-regeneration stat. The 10% spell power buff will be based upon the target’s spell power, not that of the shaman. When activated, your next Lightning Bolt, Chain Lightning or Lava Burst spell becomes an instant cast spell. In addition, you gain 15% spell haste for 15 seconds. Elemental Mastery shares a cooldown with Nature’s Swiftness. When activated, your next Lightning Bolt, Chain Lightning or Lava Burst spell becomes an instant cast spell. In addition, your fire, frost, and nature damage is increased by 15% and you gain 20% spell haste for 15 sec. The instant cast portion of Elemental Mastery has not changed. The spell haste buff that we gain has been increased from 15% haste to 20% haste. In addition, the damage to our fire, frost or nature damage spells has been increased by 15%. The two factors combined should provide a sizeable DPS increase and the addition of Feedback ensures we’re still able to shave a small amount off the cooldown of Elemental Mastery. Early versions of all talent trees were scrapped in favour of drastically reduced, thirty one point trees. These trees visually resemble those of vanilla World of Warcraft. Thanks to MMO Champion, current versions of all class trees can be found here. As part of the talent tree revamps, all players will choose their specialization at level ten. Each spec within a class gains key skills (known as primary skills) when they choose this path. Two of these skills are talents previously located deep into their tree. Reduces the cast time of your Lightning Bolt, Chain Lightning, and Lava Burst spells by 0.5 sec, and the pushback suffered from damaging attacks while casting those spells by 70%. This is a morph between the current, live version of Eye of the Storm (providing push back protection) and Lightning Mastery (providing cast time reduction.) Lightning Mastery was removed from the beta version of our talent trees. You call down a bolt of lightning, energizing you and damaging nearby enemies within 10 yards. Restores 8% mana to you and deals 551 to 629 Nature damage to all nearby enemies, knocking them back 20 yards. This spell is usable while stunned. This is our iconic AoE and mana regeneration spell as on live. Increases the critical strike damage bonus of your searing and magma totems and your fire, frost, and nature spells by 100%. As of the latest beta build launched on Friday the 23rd of July, Shamanism has also been removed from our talent tree (replaced with Feedback) and added to the elemental primary skills. Protects the target with an earthen shield, reducing casting or channeling time lost when damaged by 30% and causing attacks to heal the shielded target for 150. This effect can only occur once every few seconds. 9 charges. Lasts 10 min. Earth Shield can only be placed on one target at a time and only one elemental shield can be active on a target at a time. Increases the effectiveness of your healing spells by 10%. Reduces the cast time of your Healing Wave and Greater Healing Wave spells by 0.5 sec and reduces the pushback suffered from damaging attacks while casting any shaman healing spell by 70%. Allows 50% of your mana regeneration to continue while casting. Despite the massive revamping of the talent trees, many of our talents remain familiar to elemental players. This section will look at the new talents emerging for Cataclysm or the ones that have been changed. Increases your chance to hit with fire, frost and nature spells by 1% and grants you spell hit rating equal to 33% of any spirit gained from items or effects. At it’s maximum rank of level three, this gives a 100% spirit to hit conversion. This is undoubtedly a huge step forward for the elemental tree and frees up many players to use their offensive fire totems. A number of questions have arisen regarding this talent. The primary one being as to whether we will be forced to clip our searing totem to ensure 100% uptime of the spell power buff. Personally, I would like to see a grace period added to this mechanic, whereby the buff will stay active for a few seconds after the totem expires. This would prevent us from needing to clip our totems. Gives your Flame Shock periodic damage ticks a 10% chance to reset the cooldown of your Lava Burst spell. This undoubtedly makes for more intuitive play and precisely due to this, I’m loving this talent. At it’s highest rank (of two points), it provides a 20% chance to reset the lava burst cooldown. Theory crafting suggests, however, that it isn’t a huge increase to our DPS. In addition, there have been some concerns expressed that it will generate the potential for too much burst damage in PvP. You cause the earth at the target location to tremble and break, dealing 240 physical damage every 1 sec to enemies in 8 yard radius, with a 20% chance of knocking down affected targets. Lasts 10 sec. A criticism of the elemental tree has always been the lack of consistent AoE damage. Our area of effect “rotation” feels very clumsy and involves excessive movement to ensure the correct placement of our magma totem. Hopefully, earthquake will go a long way in rectifying this issue. In addition to the new talents specifically for the elemental tree. There are a couple of new talents that can be utilised in elemental specs. Reduces the cast time of your Ghost Wolf spell by 1 sec and increases movement speed by 7%. This does not stack with other movement speed increasing effects. It was announced that ghost wolf would be usable indoors. At it’s max rank of level two, this talent makes ghost wolf instant cast as well as providing an additional 15% speed. This gives shaman the potential to deal with movement fights much more effectively. 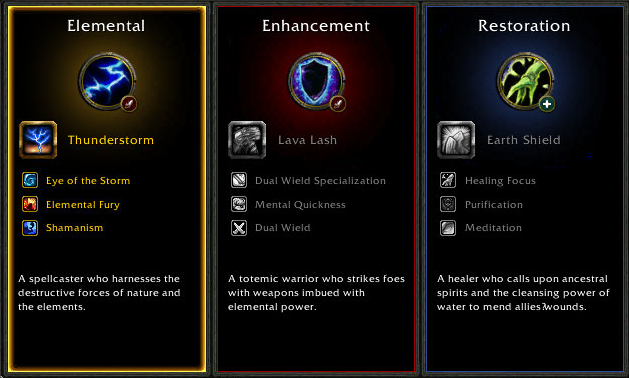 While it is a tier two talent, the enhancement tree also houses the Elemental Weapons talent. As this is a “must have” talent for elemental players, dipping into Ancestral Swiftness is very easy for us. Reduces damage taken while casting spells by 5%. In addition to our own Elemental Warding, Ancestral Resolve gives us additional survivability. Whether this will become a core talent or one purely taken on more damage intensive fights has yet to be seen. Elemental shaman can take a talent that allows all their fire totems to also offer a 10% spell power buff. Thus allowing elemental shaman to use DPS totems without losing their flagship spell power buff. Blizzard announced some time ago that they wanted to encourage players to wear the armour suited to their class. This was to combat the issue of, for example, a holy paladin rolling on a mail healing item or an elemental shaman equipping a cloth item. They chose to do this by introducing armour specializations. That is to say, if you’re wearing full mail armour you’ll receive a bonus for doing so. Masteries are derived from the mastery bonus on gear. This starts appearing on gear at around level 82. The following section is unrelated to shaman specifically but should be of interest to all raiders out there. The difficulty of encounters will be evened out with the aim of making ten man and twenty five man raiding of equal difficulty. The ten man and twenty five man encounters will now share loot tables. This is to address the issue of players feeling pressured into a particular style of raiding in order to obtain the best possible gear. An example of this can be seen in with the caster trinkets in Wrath. Ruby Sanctum, the end instance, features amazing caster trinkets on the twenty five man loot table. The ten man variant has none. The same could be seen in both Trial of the Crusader and Obsidian Sanctum. To give players an additional incentive to raid twenty five man content, there will be a higher number of drops from these raids. Legendary items will be available from the ten person variant of a raid instance in Cataclysm. Again this is to prevent players feeling forced into a specific route of raiding. There will only be one set of raid achievements for every tier of content. Whether you choose to earn the achievement in a ten man or twenty five man setting is an individual choice. There will be a cap placed on the number of valour points that can be earned within one week. It is predicted that those who raid will earn their designated number of emblems without the need to partake in daily heroics. This is to prevent players feeling the need to participate in content that they would rather not, for the sake of additional emblems. The lower tier of emblems will be known as honour points. These will be obtained from most dungeons. There will be a cap on how many honour points you can have at one time but no cap on the speed at which you can earn them. To prevent stockpiling of emblems prior to a new tier of items being released all valour points will be converted to honour points prior to the new tier going live. Cataclysm is adding a number of new class race options in addition to the two new races launching. (Goblin for the Horde and Worgen for the Alliance.) Sadly for the Alliance shaman, the Worgen will not be available to us. Conversely, the Goblins are available for Horde players. Dwarves become the new available shaman race on the Alliance side. With new races come new totem models. While the new totem designs, specifically the Goblin totems, sparked cries for all shaman totems to be redesigned, there is no indication that this will happen any time soon. Indeed blue posters recently addressed the question whether any other races would have their models redesigned prior to Cataclysm. While the blue in question stated that there was an interest in doing this at some stage (due to the older races looking dated in comparison with the Worgen and Goblin), this would not happen before Cataclysm’s launch.